Having an appetite for beauty but a limited budget has led me to think a lot about luxury. Vogue magazine is happy to show me spreads of thousand-dollar dresses on models reclining on sofas in fancy resorts and pronounce this as luxury. Yes, taste is individual. But it seems luxury is pretty well defined, if you believe the marketing. All you have to do is go to Barneys and proffer a credit card, and luxury is yours. I refuse to believe that luxury has to be expensive. For instance, with clothing, it’s not unusual that a five-dollar vintage pencil skirt has six darts on both the front and back, recognizing that a woman is three-dimensional. You’d be hard-pressed to find such craftsmanship today, even in the off-the-rack Chanel. A beautifully poached, pasture-raised hen’s egg bursts with luxury (and is something I bet most Gucci evening dress owners rarely experience). Tea in a vintage Japanese ceramic tea cup culled from Goodwill is luxury, too. And perfume? To me, luxury equals good materials, orchestrated with imagination, skill, and invention. For the perfume lover, sometimes this means coughing up for the latest Parfums MDCI (to name one perfume house of many). Or, it means dropping a pittance at the drugstore for a bottle of Dana Tabu. Oud in perfume can signal luxury, for sure. Natural oud is rare and expensive, and it’s been used in certain luxurious, ground-breaking fragrances, such as Yves Saint Laurent M7. But an oud fragrance can also signal “we need an oud perfume in our line, because the Middle Eastern market likes oud and they have money.” Maybe that sounds like good business, but it sure doesn’t guarantee a fragrance is luxurious. 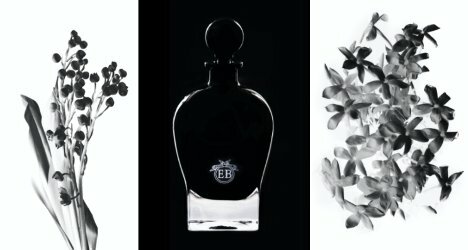 Eric Buterbaugh’s floral oud perfume line meets the consumer definition of luxury, meaning that it’s expensive — $395 for 100 ml for the floral ouds — and it’s sold at Saks Fifth Avenue, a high-end department store. But does it meet the aesthete’s standards for luxury? The Eric Buterbaugh Floral Oud line includes Rose, Orange Flower and Lily of the Valley. Here we’ll look at Orange Flower and Lily of the Valley. Floral Oud Orange Flower’s notes include champaca, frangipani, Egyptian orange flower, bergamot, patchouli, vetiver, vanilla, oud and oak moss. Orange Flower is a joyful, welcoming oriental that most people probably wouldn’t classify as an oud in the classic sense, since it lacks the metallic oyster-like note characteristic of oud. Floral Oud Orange Flower oozes friendly orange flower, bursting with bergamot, that joyfully slobbers its way to my nose like a Labrador retriever puppy. It’s loud, obvious and charming, and it refuses to sit. When I wear it, people tell me how much they like how I smell, just as they’d smile and tuck into a syrupy orange crème caramel if we were at a café together. Floral Oud Orange Flower darkens with patchouli after an hour or so, when its bergamot finally loses its sparkle and is overtaken with vanilla, but it never really becomes serious. The fragrance persists with good sillage for another five or six hours. All in all, Floral Oud Orange Flower is simple and cheerful and not particularly complicated. Floral Oud Lily of the Valley’s notes include bergamot, cassis buds, lily of the valley, tuberose, oud, amber and sandalwood. Like Floral Oud Orange Flower, Floral Oud Lily of the Valley doesn’t flaunt its oud but stashes it out of sight in a chorus role. Unlike Floral Oud Orange Flower’s singular focus on orange flower, this one casts lily of the valley against the green-tart scent of cassis for a robust but elegant oriental fragrance. Floral Oud Lily of the Valley actually kicks off with more orange flower than the bergamot-heavy Floral Oud Orange Flower does. Then it sails into black currant and a partying variety of lily of the valley, until the lily of the valley puts on her coat and goes home well before the music stops. After a couple of hours of wear, the cassis melts into a vague vetiver and sweet sandalwood that whisper for another four hours before disappearing completely. I was left thinking that wearing this fragrance was a fine and comfortable ride, but then so is eating a popsicle when it’s hot. It was nice, lovely, and ultimately not particularly compelling. If dropping a hundred dollars for 10 milliliters of easy, pretty perfume sounds good to you, then I encourage you to seek out these floral ouds. They’re certainly likable enough. If, like me, you demand a lot of luxury for your money, then nurture your own patch of lilies of the valley in the garden and save orange flower for a real tree in spring — or maybe a bottle of L’Artisan Parfumeur Séville à l’Aube. What constitutes real luxury for you, both in perfume and in life? For perfume, I like the freaky risk of vintage Christian Dior Miss Dior and the breathtaking luxe of old Lanvin Scandal Extrait. For life, I nominate clean, crisp sheets; hot baths; and the sound of crickets in late summer. Eric Buterbaugh Floral Oud Orange Flower and Floral Oud Lily of the Valley are available at the Eric Buterbaugh website and at Saks Fifth Avenue. They cost $595 for 250 ml, $395 for 100 ml, and $95 for 10 ml. I was thumbing through the September issue of Vogue yesterday, and spied Mr. Butterbaugh’s Liberace meets Captain Stubing visage. Methinks one is paying for that ad congratulating Vogue on its anniversary. And whoever chose Cindy Crawford’s photo must be jealous of her skin care money. She is a beautiful woman and the photo looked odd to say the least. Okay, enough of my tangential b!tch!ness. That’s worth seeking out on YouTube! In the photos I’ve seen of Mr. Butterboe he looks far more likeable than that. A cheerfully smiling beer of a man. I used to have a subscription to Vogue and bought the fall fashion issues of all the magazines, too (you’d laugh if you saw my distinctly unfashionable wardrobe). Somewhere along the line, I lost the urge. The internet feeds a lot of my fashion hunger, true, but I also think I’m simply more interested now in style, not fashion. I have not smelled every gardenia perfume out there, but for me the best gardenia is the real thing. Gardenias are hard to cultivate where I live, so I’m very proud that my little pot of miniature gardenia flowered its merry heart out last summer, and well into autumn. THAT was luxury for me. Something I’d thought about and created but which ultimately cost very little. Luxury can have something to do with being hard to get (hence the high prices on luxury goods) but luxury is not just about obtaining an expensive object. It’s about how we interact with and respond to things. (It takes a bit of wisdom and experience to recognise quality when you see it, like the skirts with the 10 darts, or the perfect old teacup.) We bring more than money to how we experience luxury – thankfully! How boring would life be if all you had to do is plonk down money for what you want. That said, I do love a Chanel lipstick! It is great to be able to splurge sometimes on something beautiful. I’m jealous of your success with gardenias! I’ve had two plants, and neither have made it longer than a year. You’re so right, though–the scent is the very definition of heavenly. Not too get too garden-nerdy, but the secret of my gardenia success seems to have been the realisation that they prefer a slightly acidic soil. So now I give mine azalea food about twice a year. That, plus regular liquid fertiliser in summer, and moist soil. I just happen to have some azalea fertilizer in my garage right now! Maybe I’ll give gardenias another try in the spring. Real gardenias are heavenly. I had a black evening outfit in college that I wore with a single fresh gardenia pinned as a brooch for my jewelry. The smell was gorgeous and I always felt so elegant. It wasn’t expected save but it felt like luxury. A single gardenia beats a brooch for luxury, in my opinion. Luxury for me usually equates to time. A leisurely morning on my deck drinking coffee and catching up on NST, a long hot bath with a glass of wine (only a fond memory for me now since I no longer have a tub ???? ), having brunch while everyone else is working are all things I think of as luxurious. That said, sometimes plinking down a bunch of money for something frivolous can feel good and pay off too. Have to admit to spending what was for me a ridiculous amount for the Frederic Malle iris hand cream and it was worth every penny. It is the nicest hand cream I’ve ever tried and smells fabulous! I 100% agree with the luxury of the FM Iris Hand Cream, so much so that I bought a back-up from the get-go. It sounds like we share a similar definition of luxury! And it’s funny you should mention the FM iris hand cream, because I almost mentioned it in the post as something that’s truly luxury from a luxury company. A friend let me try a bit of hers last month, and I was smitten. Just may have to buy my own eventually. I absolutely agree – free time is the only real luxury. That said, I’m an antiques dealer, and most of my “nice” things were purchased quite cheaply and cleaned up/repaired by me, so I think I have a skewed sense of the ways money and luxury intertwine. I had to laugh at the mention of Tabu here – I found one of those 80s violin shaped minis in the thrift store last month and bought it for $2! Still smells great. It’s your appreciation and knowledge of these nice things, though, that allows you to buy them on the cheap. That kind of appreciation is something we can develop, if we want, and will bring even more luxury into our lives. And, yes, let’s hear it for Tabu! These days luxury is getting two days in a row on the weekend and not feeling like a spaz. It’s kind of a sliding scale for me this past year for sure. But I think having hot baths/showers anytime I like and getting to eat pretty much any food I like when I want is about as luxurious as it gets. Wardrobe luxury for me, is one of my 15 year old REAL merino wool dress sweaters that wear and feel like nothing else, and an opportunity to wear my real alpaca car coat – it’s like walking in a cloud.. I totally agree that nothing is as good as older well made clothes. For fragrance – luxury is hitting the nail on the head when I pick the right fragrance for the right day and the right mood. Like a perfect overlap of sentiment and application to keep me in the right place most of the day long. Breathe easy soon Angela! I have two dressing gowns that are pure luxury to me, so I understand how you cherish that dress and coat. Thanks for the air quality wishes, too. The air has pretty much cleared where I am, but I hope the fire is contained soon. I just got back from a week in the woods, so luxury for me is hot running water and a comfortable warm bed. Luxury doesn’t have to be expensive, it just has to tap into our pleasure sensors in a deep way. A hot cup of assam tea every morning makes me very happy. And a cup of Assam tea in a beautiful cup is even better! I remember the sheer luxury of eating a fresh orange after a two week backpacking trip in the mountains, eating only freeze dried food. All these years later an orange can still feel like a miracle to me. A good orange really is a miracle, especially compared to the mealy, under-ripe oranges I always seem to put in my shopping basket. I really need to learn how to pick a good orange. Oh, Angela, I just love your point of view. I completely agree that luxury has far more to do with the quality of an experience than the price of it. For me, true luxury is being able to smell a fresh flower, to eat an amazing meal in good company, to travel to a place I’ve never been full of new sights, sounds, and smells. Perfumes are powerful reference points, bringing back vivid memories of those experiences or pointing in the direction of new experiences I’d like to have–even if it’s unlikely that there’s world enough or time to have them. Money is sometime a means to those ends, but not always, and never an end in itself. There’s usually much more satisfaction in finding a meaningful experience on my own. It would be kind of a sad thing to feel I had to pay someone else inordinate sums to find them for me. Yes, yes, and yes! Some luxurious things certainly cost good money–I’m thinking of handmade Italian shoes, for instance–but so much of luxury is about appreciating the amazing, everyday things around us. Thank goodness, because that means luxury is accessible to everyone! But seriously – to echo some of the above sentiments, TIME for sure is a luxury. Perspective, to understand value. The presence of mind to not be rushed. Time is a gigantic luxury! That said, so many of us trade time for things that don’t make us as happy as the free time would. I have sometimes spent a lot for perfume and felt it worth every penny, but I have also found incredible vintage perfumes on ebay for less than most niche fragrances. But the ultimate luxury is time, no? Yes.Time!I mean it is September 12th,in a months’ time it is our year end function,WHERE has this year gone???Crazy. My favorite perfumes are the vintage tester bottles at the shops,long forgotten and dusty,only coming out if a curious perfumista asks about them.Sometimes they even become “GWP”,or really really cheap!My vintage Diorrissimo was such a find. Wow! What a way to get vintage Diorissimo! Back when I was browsing ebay extensively for vintage perfume, I used to see some wonderful items in South Africa. I never bid on any because of the shipping costs, but I realized it might be a great place for finds like your vintage Diorissimo. Congratulations! Time is such a luxury–time to use as you please. And, of course, I’d never argue with the luxury of a discovered vintage perfume gem. “I refuse to believe that luxury has to be expensive”. Amen. Thank you, Angela!!!! Luxury for me is quality time spent with those I love in a relaxed and meaningful manner….sometimes the simple can be so profound. As far as perfume goes, I am both in awe and in disgust at what has happened to the niche market (and even mainstream and artisanal for that matter) with regard to prices. Like you I remember drug store perfumes that far exceeded some of the current niche offerings and that literally sold for a song. Even my beloved No 22 was highly affordable before it became an “exclusive”. I guess I am on my own quiet little boycott against these brands that are charging these exorbitant prices for both practical and philosophical reasons. I think if more of us said “NO” to these high prices something might change. But if we keep shelling out the money the prices will continue to climb. I suppose many perfume lines will charge what they can get from consumers, and some consumers have enough disposable income to pay it. Still, the price hikes have to slow down eventually–I hope! Leaving a serious comment now,but here goes:I’ve realized quite recently two things:Living a simple but fullfilled life is a true luxury,and the luxury of time well spent! “Simple but fulfilled life” sounds very luxurious! Maybe part of that is the age-old practice of mindfulness, where you pay attention to those simple things, and they reveal their luxury. Enjoy spring! For me, autumn is coming down the pike at top speed.